Moody's bank downgrade: Cause for concern? Yesterday evening Moody’s downgraded Australia’s “big 4” banks, plus 8 smaller ones, from Aa2 to Aa3 on their long-term rating, while leaving their short-term rating unchanged. So Moody’s have finally joined the bank knocking party, the ratings agency who missed the whole GFC, so should we be concerned? Interestingly its rival the Standard and Poor’s rating agency recently only downgraded the smaller Australian banks, leaving the “big 4” alone for now - please note ratings agencies is an industry space we have limited respect for as they are usually too far behind the curve e.g. Surely any investor who was considering selling our banks due to property price concerns has already pressed the trigger. 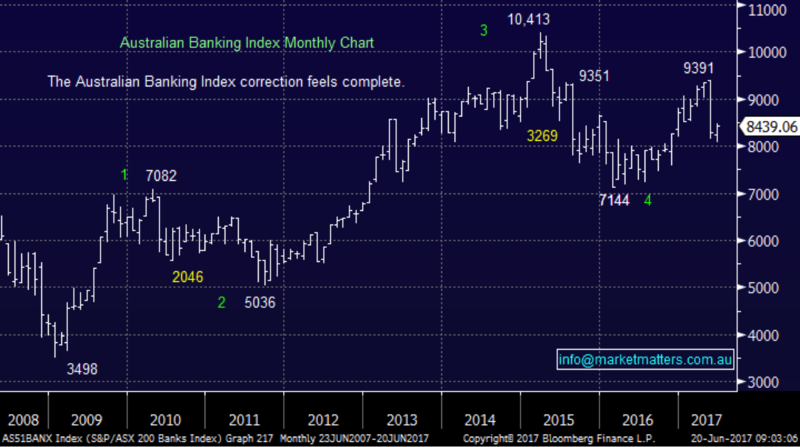 Australian banks have corrected over 30% from their March 2015 high and 14% since last month’s high alone. The clear point is plenty of selling has already materialised leaving the banks now paying very attractive dividends e.g. on a grossed up basis ANZ 8%, CBA 7.3%, NAB 9.3% and WBC 8.7%. Pretty attractive yields when it’s tough getting a term deposit paying 3%. "In Moody's assessment, risks associated with the housing market have risen sharply in recent year etc." Moody’s. Australian banks allow greater leverage, with 50% of loans made to people who have borrowed over 6x their income whereas in the UK 4.5x is the maximum allowed. The growth of interest only loans over recent years concerns many people, although the regulator has now capped this growth. However in Monday night's statement, Moody’s also altered their outlook from negative to stable, hence the impact of the downgrade should in theory be minimal as its was totally flagged, although a clear headline grabber. The downgrade is likely to lead to a small increase in the banks’ funding costs but as we know this is likely to be passed onto the consumer. 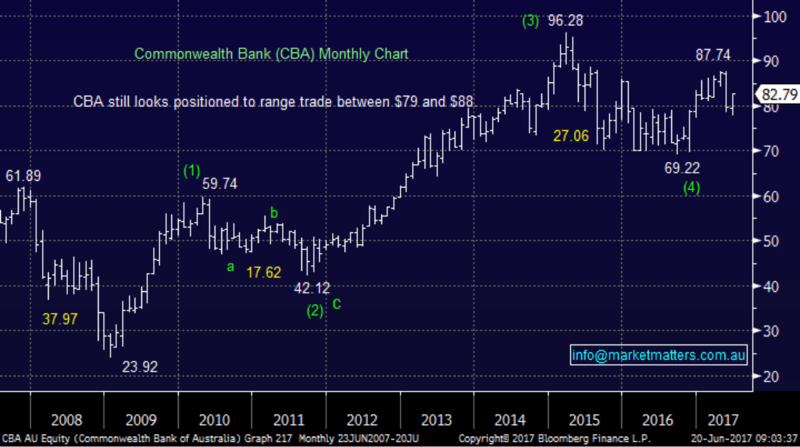 Technically CBA remains bullish and a stock we would consider adding to our position if excessive selling were to unfold. Interestingly Moody’s did exactly the same to Canada’s big banks, again because of concerns of an overheating housing market just over a month ago. The correlation between the major Australian cities and Canada’s housing market is huge hence this downgrade should come as no surprise to local investors, we actually flagged it back in mid-May following the Canadian decision. 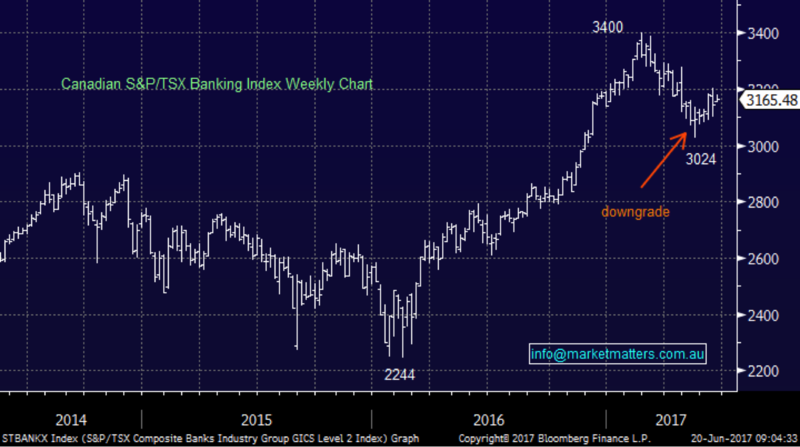 The result in Canada was the banks fell ~3% over two weeks before rallying strongly to be back above where they were when the downgrade occurred. Considering the Canadian banks were already correcting a phenomenal 51% rally since December 2015 none of these moves are a major concern at this point in time. Our view is long-term interest rates will continue to be the main driver of banking stocks assuming Australian property does not collapse, and we think it won't. 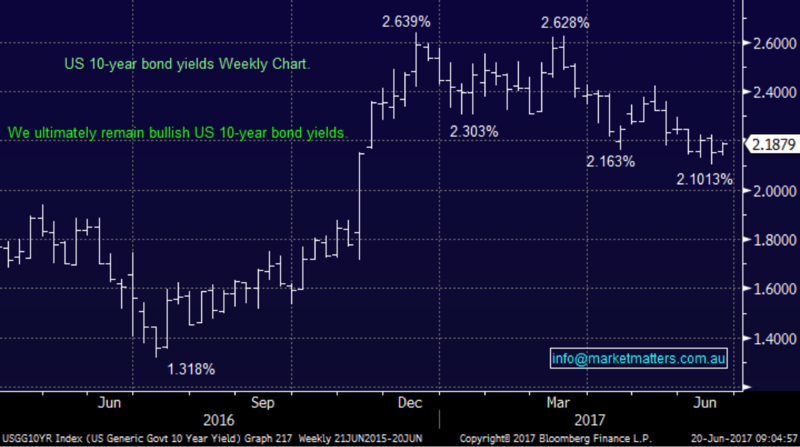 A hint of renewed strength in the US economy and / or a pick-up in inflation should send US 10-year bond yields back over 2.2% and potentially towards 3%, a very bullish scenario for bank margins. At this stage we think the market is wrong in terms of US rate expectations and they will rise more inline to the Fed view than current market positioning. Long term bond yields - we are bullish long term interest rates which should be very supportive of bank stocks as it leads to larger margins / profitability. Housing Prices - Undoubtedly a fall in housing prices will lead to increased bad debts for Australian banks and reduced profitability but we believe a huge amount of this potential move is already baked into bank stocks. If our bank stocks do soar into the months end as investors get set before the Super changes we would consider writing call options for the sophisticated investor.